The term stuzzichini is any type of food which can be served in mignon. Hors d’oeuvres consumed in one mouthful, maximum two bite sizes. Served prior to a buffet,party,dinner,or a happy hour after work. 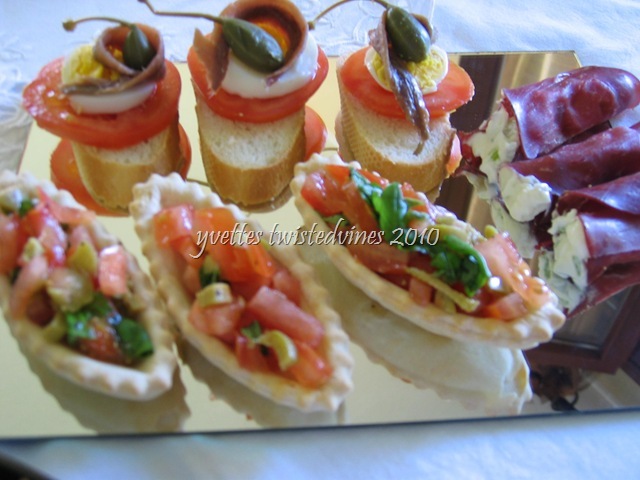 “Stuzzicare” refers to a little snack, when we can hold a glass in one hand, and we’re free to pick up an hors d’oeuvre in the other, usually without using a piece of cutlery. When entering a bar,here in Italy, after a certain hour…ordering a drink, stuzzichini are served free of charge. Capturing those taste buds with mouthwatering bites, however you nearly always go back and purchase another plateful. Usually a small plate with a variety of 3 or 4 stuzzichini. It’s all in the preparation,eye-catching,colourful and always tempting.The variety is unlimited and you can have fun creating your own.Stuffed meat rolls,salmon with cream cheese, stuffed capsicum strips,prosciutto stuffed with asparagus cream,zucchini strips with gorgonzola,devils on horseback,angels on horseback,rice balls,puff pastry swirls. Generally, stuzzichini are easy to make, made at the last minute,easy to assemble,or prepared a few days before, kept in the fridge and then at the last minute put under the grill or a heated oven. 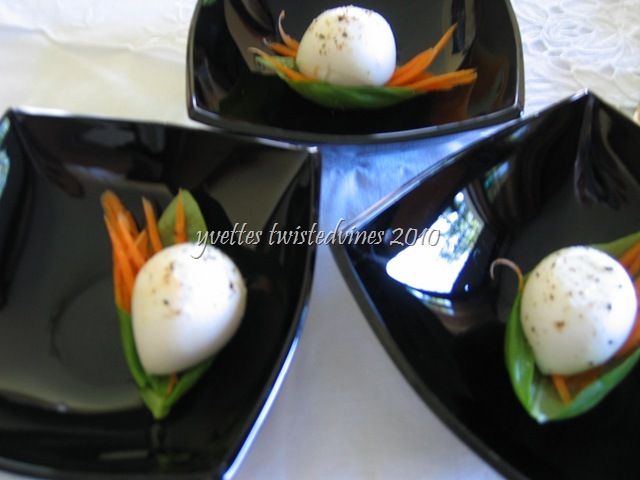 Presentation on the serving plate is also important as is the garnishing.Those fine details that capture the eye and send those taste buds wanting more…irresistible! G’Day Girlfriend….unbelievably colorful and looks sooooo scrumptious!! And like you said, you can create your very own!! This one is a YES on my table and am going to try it this coming weekend!! You are so ready to open a B&B girlfriend!! I can see and feel your passion….and right back at you..irresistible!!! Love from OZ!! Your stuzzichini look so tasty…I’m hungry!! 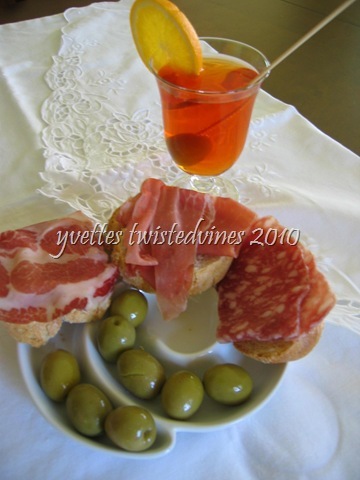 Since it is going to be 36C here this weekend, I am planning on having a Stuzzichini Sunday! 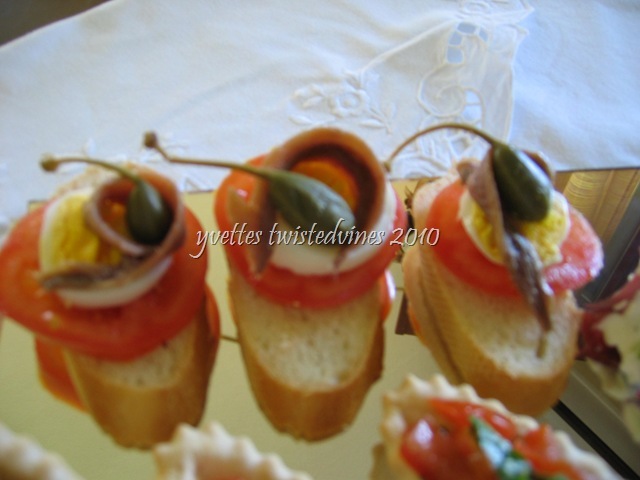 What a great idea for dinner on a hot summers day…we’ll be chillin’ with stuzzichini and wine! Love your Wednesday Words as always!